More Than A Church, We’re a Family! I was first introduced to LICF through their Sports Ministry. After being away from Long Island for several years, and not knowing where to meet other LGBT people, I started asking around about where could I find a softball team. That was when I learned about the LICF Angels. I made a phone call and was quickly invited to play on their team. I heard some of the players speaking of LICF and was invited to worship and fellowship with them. I went to my first sunday service about 3 years ago, and have been attending services regularly since. When I walked into the sanctuary I felt what they meant by “family”. What a welcoming environment, I have never felt like I was home in a religious setting before. I have since become a member and found that my life Is changing and I am now on one of the best journey of my life. My faith walk. What does LICF mean to me? Family, love, friendships and trust. I’d been searching for a church where I could be myself and be accepted for who I am. I found that here at LICF. From the moment I walked in I felt welcomed. After hearing Pastor Shane I knew this would be my place to call home, to worship God. The friendships I’ve made will stay with me forever. My spiritual growth with the Lord helps me be a better person with the choices I make in life. I’m thankful everyday that I came to LICF. I look forward to every Sunday service and events that we share as a family. My life has been enlightened with the blessing of a new found family in the LICF family.Being a member of LICF has helped me regain my faith in life, people and most importantly in GOD. I came to LICF in April of last year. I can’t express how much love the church gives me. LICF is more than a church, we are a family. I love my church so much! “I’ve been attending LICF for a few years now. So it was interesting that one Sunday while listening to the choir sing a medley, for the first time, I could feel the Christ within. LICF is an answer to a prayer. A prayer that my faith may grow”. “The first time I walked into LICF I knew I was home! I felt peace and love which is what I had been looking for in a church. I am so happy here. If I had to describe LICF in one word it would be Home“. LICF is my safe haven, I feel so very welcome. I can close my eyes and pray to God and I can feel his presence. I count the days when I can go to church. I have never felt more happier than I am since I walked into LICF church. I have a family that is there for me 24/7. They are my walking Angels and when church is over I feel like a new person. In 2007, we bought our first home in Long Island and we were searching for a church we could call our own. After visiting a few church communities, we stumbled upon LICF. The members were so welcoming – with open arms and smiles on their faces; Pastor Shane filled the room with God’s Word of love and acceptance (regardless of who we are), and the music played was uplifting and joyous! We knew that was home. The LICF community has become our extended family throughout the years. Although our busy lives and travel schedule, sometimes keep us away, we know we can always walk in the door and feel at home. LICF is a growing community striving to reach all those looking to regain their faith – it is a place you can be yourself and know that we are all loved by God. Thank you LICF! “LICF is a place I can go to give thanks to my Lord and Savior Jesus Christ for all he’s done for me throughout my life. At Long Island Community Fellowship ( in the presence of the Holy Spirit) I can join together with like minded people to worship and praise God in the beauty of Holiness”. 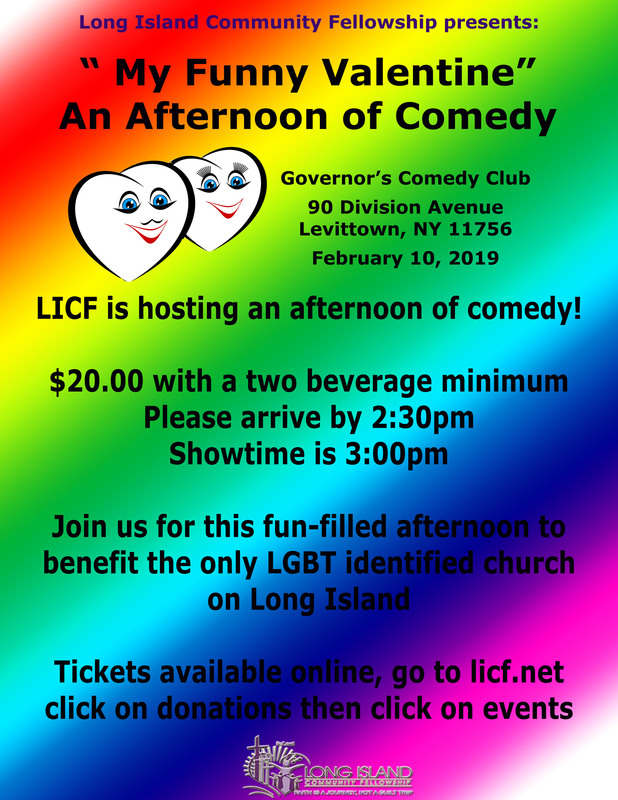 “Long Island Community Fellowship Church prides itself on welcoming everyone no matter race, gender or sexual orientation. As a mother of a child with autism this welcoming nature goes beyond tolerance and acceptance. LICF Church embraced us both as family. I came to licf about 3 years ago because a friend was becoming a member and wanted to support her. I was done with church and religion years before and so was only coming for that day. When I arrived I was greeted like I was a friend who had been away on vacation! Never have I felt so welcomed as I am at licf. Family, peace, love and joy live here. The foundation is built on God’s love for us all. I can’t imagine a better church to be a part of.